Darwin's orchid, shown above, attracts the hawk moth of Madagascar. 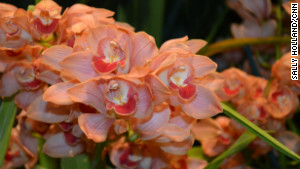 The red roses of Valentine's Day have withered, and the yellow daffodils of spring have yet to bloom, so it's orchids that are having their time in the spotlight at the Smithsonian in Washington. The orchids on display in an exhibit called Orchids of Latin America are strikingly vivid and manipulative. "It is believed that at least a third of all orchids engage in some kind of deception," said Tom Mirenda, an orchid collections specialist at the Smithsonian Gardens. The flowers are trying to trick bugs and insects into carrying their pollen from plant to plant, according to Mirenda. Sometimes, things can get violent. Consider the Catasetum orchids and the euglossine bees that are attracted to the scent of the male flowers. "I want you to imagine a rubber band being pulled," Mirenda said. "When a bee touches this little trigger hair that's on it, suddenly, *THWACK,* this gigantic wad of pollen comes and smacks it right on the head in the back. It's a little bit dazed from that." The bee will head for open space and sunlight, where he finds a female Catasetum orchid. "He's basically duped and manipulated into harboring himself inside the female until he recovers from being mugged by the male flower," Mirenda said. In the process, the pollen is delivered to the female flower. Even more treacherous than the Catasetum is the Coryanthes, or the bucket orchid. Its name comes from a lip on the flower that holds liquid, creating a miniature bee swimming pool. Once again, the bees are drawn by the smell. "They get kind of rough and tumble with each other, like bees will, and eventually one or two will fall inside the bucket. They are literally drowning in there. It's horrific," explained Mirenda. The flower provides one escape hatch that dumps the bees into a mess of pollen. So the bee survives, but there is pollen attached to his back that he carries to the next flower. Some orchids are just lazy. 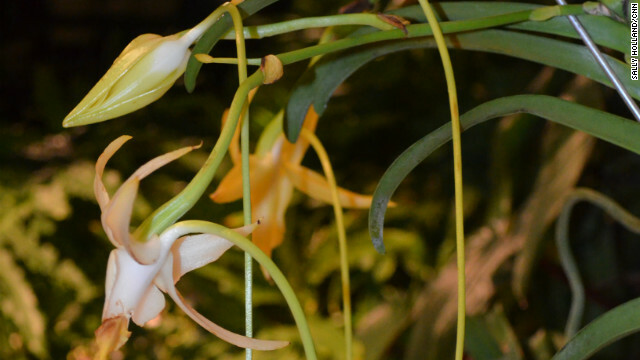 The Epidendrum produces no nectar and has hard-to-chew leaves - nothing to attract a pollinator. What it does have are small clusters of flowers that are similar to those of a milkweed. And Monarch butterflies love milkweed because it has lots of nectar. Who could blame a butterfly for confusing the flowers of the Epidendrum with those of the milkweed? Especially if they are growing right next to one another. "These guys are taking advantage of this hard-wired behavior that the butterfly has," Mirenda said. "They are just literally getting the services of their pollinator for free." It's not just bees and butterflies that are bamboozled by orchids. The hawk moth of Madagascar is critical to the pollination of the Angraecum sesquipedale, or Darwin's orchid. After seeing the foot-long nectar spur on the orchid, evolutionist Charles Darwin correctly predicted the existence of a moth with a foot-long tongue that would be necessary to pollinate the starry white flowers. The Orchids of Latin America exhibit includes plants from the Collections of the Smithsonian Gardens and the U.S. Botanic Garden. The flowers will be blooming at the National Museum of Natural History until April 21. The bee helping the flowers is not a he. "He" is a she. Can we carry this futher and say that all living organisms are geared for some kind of deception for survival? What are the implications of this on human behavior? Can we carry this futher and say that all living organisms are geared for some kind of deception for survival? What does this imply about human behavior? I love Orchids! They are such cool plants. I have a nice little collection going now. time to ban orchids- enough of their free loading and deception!